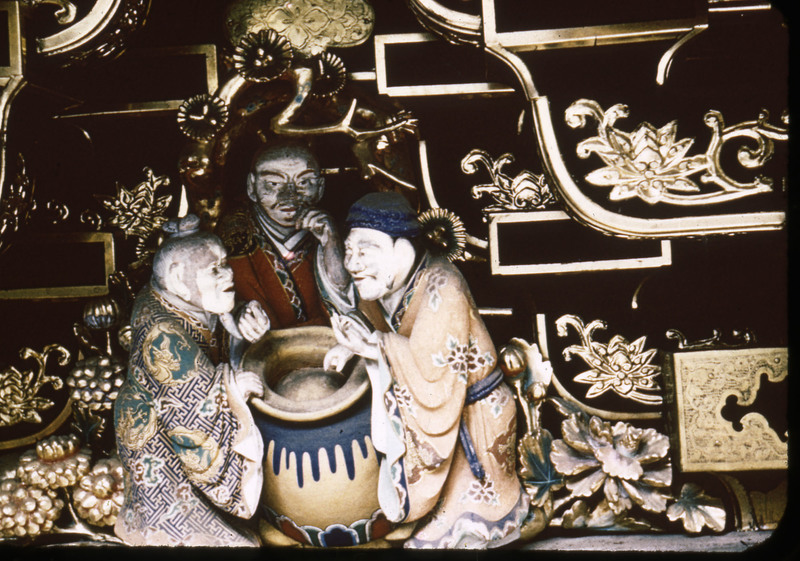 Three men huddle around a cauldron in this lacquered wooden carving. The nemurineko is a result of Jingorō's determination to create a new style. 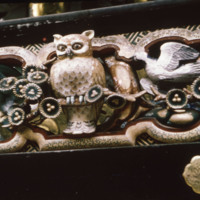 A lacquered wooden carving of an owl is evidence of the Japanese fascination with animals in art. A carved cylindrical decoration from Yōmeimon exhibits a pleasing symmetry. 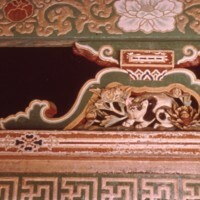 Green and gold bring out the detail of a lacquered wooden carving of a dragon. Elaborately carved wooden panels adorn a building. 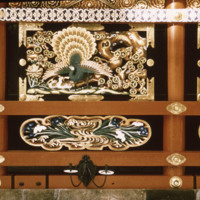 Wooden beams frame this intricate lacquered wooden carving of a bird. 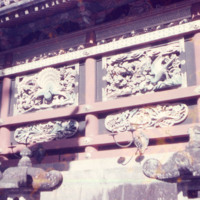 Dragons dominate this portion of an elaborate roofline of Yōmeimon Gate at Nikkō Tōshōgū. 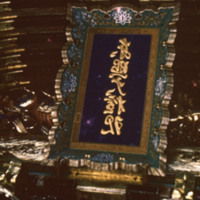 A tablet with gilded kanji stands in front of an almost opulent display. Japan has some of the world's greatest sculpture, virtually all of it Buddhist. Initially, Japanese sculptors were heavily dependent upon Chinese art. Medieval Buddhist art in Japan tends to be much better preserved than in China or Korea. In Japan and China wooden carvings have long been used to decorate temples and private dwellings. Japanese paintings and sculpture are mostly housed in the temples which hold them, limiting their availability outside of Japan (at least before the advent of the internet). Sculptures have tended to remain within the shrines for which they were originally made. Japan's most famous sculptor was Hidari Jingorō, born in A.D. 1594. 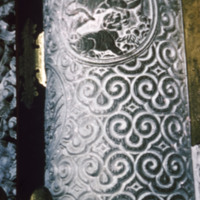 In the mortuary shrine of Ieyasu at Nikkō, the two elephants and the sleeping cat (Nemurineko), pictured on this page, were created by Jingorō. Through Jingorō's insight and new technique, animal sculpturing would take a new direction in Japan - the realistic appearance of animals rendered in fine detail by the artist. Older Japanese sculptors did not often focus on portraiture in their work; Japanese artists tended to focus on decoration and small details in sculpture rather than pictorial art and representations of big ideas. Japanese artists generally preferred to concentrate on nature in their art rather than mankind. 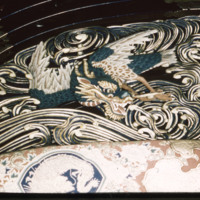 In the seventeenth and eighteenth centuries, Japanese artists created the charming painted carvings of flowers and birds in the Nikkō temples, pictured here, and those at Shiba and Ueno in Tōkyō. “A Great Japanese Wood Carving” by Basil Gray in The Burlington Magazine Vol. 93 No. 577, April 1951, pgs 105-107. 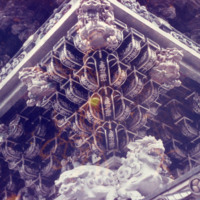 Nikkō Tōshō-gū Shrine and Hidari Jingorō by Zempei Mastumura, Nohi Publishing Company; Japan, 1975.